Alphabetically sorted. Note: GPS coordinates are in whole degrees, not degrees.minutes. 800m noth of the corner of Pymonts Lane and Limekilns Road. Located on the Cootamundra - Gundagai road 11km south'ish from Cootmundra. Accommodation: Southern Comfort Motor Inn. 24-28 Parker St (Olympic Way). (02) 6942 3366. Follow Redfern St strait out of town and it becomes the Canowindra Rd. The signposted turnoff to Bangaroo Quarry Rd is 24km from the Cowra PO and is 8km from Canowindra PO. 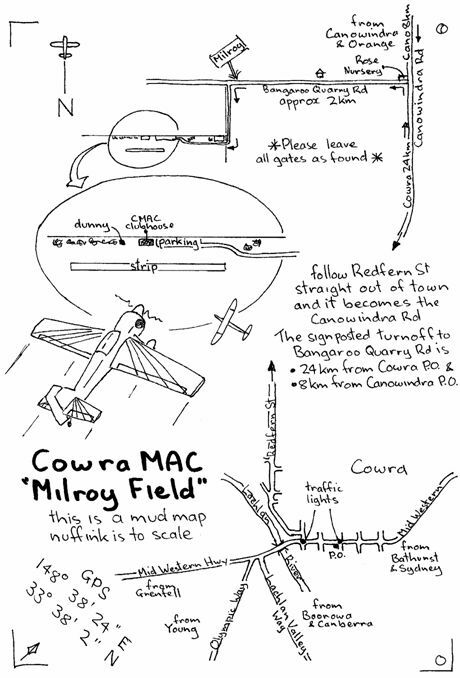 2km look for "Milroy". Click here for a really pretty picture!!! The Don MacIndoe field is on the Raymond Terrace Road east of the Golf Club and next to the Maitland cemetery. At East Maitland, turn north on High Street, turn right onto Raymond Terrace Road. Accommodation: Palm Valley Motel, Tarro. 02 4966 5777. Dinner at Beresfield Bowling Club dinner at 7:30. This is not a general purpose flying field. Please contact Jeremy Randle 0418 390 446. 5km south of Muswellbrook on the eastern side of the New England Highway. Accommodation: Centabrook Motor Inn 02 65433444 is next door to the RSL. Heading south on the Princes Highway about 120km from Sydney into Nowra. After crossing the Shoalhaven River Travel 2.6km and turn right into Kalandar Street. Travel west next to the cemetery for 350m to the roundabout and turn left into Albatross Road. Travel approx 1.7km to the entrance to the Greyhound Track on the left. Follow the signs in. Accommodation: Marriott Park Motel. Cnr Douglas St and Princes Hwy Nowra. 02 44216999. From the intersection of Windsor Road and Pitt Town Road, head east'ish towards Pitt Town. 2.5km turn Left onto Pitt Town Bottoms Road. About 2.5km field is on the right. Accommodation: Gateway Motel, Vineyard-Phone 02 96276022 or 02 96272281. Just south of the intersection of the Briars Sharrow Road and the Bungendore Captains Road. From Queanbeyan: From the interstection of the Suttons Forest - Bungendore Road. Take the Bungendore road (52). 2.5km turn right onto Captains Flat Road. 4.2km left onto Briars Sharrow Road. 5.8km right onto Bungendore Captains Road. 500m field is on the right. Turn north from Windsor Richmond Road into Percival Street. Turn right 1.2 Klm along Percival Street, just past main entrance to RAAF base.